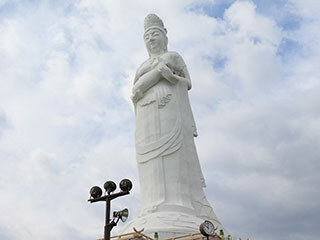 Kamaishi Kannon Statue (釜石大観音) is a huge Buddhist Statue located in Kamaishi, Iwate. It is 48.5m tall and stands on the cliff that is 120m high from the sea level. It has great view of Kamaishi Bay. It is main feature of Sekiousenji temple of Soto Buddhism. Inside of the Kannon, there are many Nata carving buddha statues. Admission: 500 yen, 300 High and Junior 300 yen, 100 yen for under. 1. use local bus to Kamaishi daikannon. Kamaishi Dai Kannon is great Kannon Statue located Kamaishi, Iwate Prefecture. It was constructed in 1970. Inside of the statue, there are many Buddha statues carved by Nata, this is the traditional way of carving in Tohoku region. There are 7 lucky gods statues as well. In side of the temple, there are restaurant and gift shops.